The University of Alicante finds a funerary inscription on a tomb at the ancient Roman city Baelo Claudia. This unique finding in Hispania was recently presented by Andalusian Government Culture Counselor Miguel Ángel Vázquez in the archaeological site of Baelo Claudia, in Tarifa (Cádiz). Led by Fernando Prados, from the University of Alicante Institute for Archaeology and Heritage Research (INAPH), experts from the universities of Granada, Murcia, Alicante and Madrid have taken part in the project , with the collaboration of the Baelo Claudi Archaeological Site staff, along with students and volunteers. The research work has revealed that the most important tomb, located in the most privileged area of the necropolis, belonged to a powerful woman whose name was Junia Rufina. Vázquez stated that "the find has an extraordinary value because, in addition to the unique nature of the inscription, for the first time in our country, a set consisting of a funerary monument, architectural elements of great value and a female sculpture wearing a toga, proof of female power at the time." As detailed by UA researcher Fernando Prados, "the extraction of the piece has allowed us to verify that the inscription is complete with allusion to a woman who was buried in this mausoleum, just in the same place where a little more than two decades ago, the female statue that is exhibited in the Museum of the archaeological site in Tarifa was exhumed, which we can now interpret as her portrait.” According to the researcher, it is an exceptional find given that the metal letters were systematically plundered and melted after the abandonment of the buildings of which they were a part, and it is for that reason that the piece is unique. 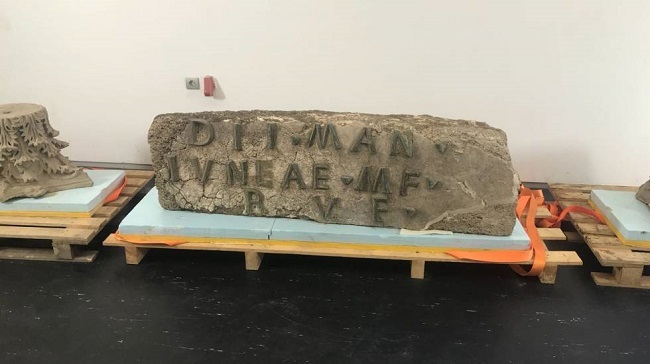 "The promptness and virulence with which the mausoleum collapsed caused the lintel to fall face down and these letters were covered until its recent discovery," Prados said. The main piece, an inscription in bronze, was excavated on 4 June and an exhaustive analysis and archaeological study is being carried out ever since in this deposit, along with the rest of the materials, among which architectural elements stand out, such as rich capitals. In particular, the UA expert explained, the excavation of the mausoleum has allowed us to pinpoint Corinthian columns and capitals of great quality made in marble, imported from different places of the Roman Empire, as well as decorative elements sculpted and painted that were part of its architectural decoration. It is indeed a monumental set that reflects the splendour and artistic brilliance of this Hispano-Roman city around the 1st and 2nd centuries of our era, which was was demolished by the force of a devastating earthquake in the 4th century. In parallel, a street perpendicular to the road that linked Baelo with Carteia, a prolongation of the city Decumanus Maximus has been found. These discoveries open up the possibility to define new itineraries in the archaeological site to make these previously unknown elements public and, in the same way, to explore new avenues for research. Fernando Prados points out in the conclusions of this speech that the exceptional nature of the finding comes to offer a new potential for the enhancement of Baelo's funerary space. The epigraph discovered can be a magnificent resource and will contribute significantly to increase the wealth of this unique enclave and renew the permanent exhibition of the archaeological site. In addition, it opens the virtually unique opportunity on a national scale to be able to propose a new access to the circuit of visits to the site from one of its main axes, the same one that was used 2000 years ago, which would imply an unquestionable added value. "Esto mejoraría sustancialmente la calidad informativa y didáctica de las visitas, convirtiéndola en una experiencia única, al nivel de las que se pueden realizar en Pompeya, Ostia y otras célebres ciudades romanas", destaca Prados.